John Maynard Keynes famously titled his magnus opus from 1936 The General Theory of Employment, Interest and Money. However, General Theory, as it is generally known, is nothing of the kind. It is not a General Theory of macroeconomics – rather it is a specific theory of macroeconomics making very specific assumptions about the workings of the economy and I will argue here that Keynes made very specific assumptions particularly about the monetary policy regime or rule under which the economy operates. Keynes most likely realised that he had made these assumptions, but later generations of Keynesians – particular from the 1950s to the early 1990s “forgot” that General Theory and the general macroeconomic of implications of it was fully dependent on the fundamental assumptions in General Theory about the monetary policy regime/rule. When I took my first macroeconomic lessons at the University of Copenhagen in the early 1990s the first model we where introduced to was a rudimentary Keynesian model – the so-called 45-degree model or the Keynesian cross. It was basically said that the model was what Keynes was thinking about in General Theory and I would still agree that this simple model basically captures what Keynes was saying in General Theory about aggregate demand. When I was taught this rudimentary Keynesian economics we were told that Keynes assumed that prices are sticky and this was what really was the difference between Keynes and the so-called Classics (economists before the Keynesian revolution). We today know that Keynes’ claim the “Classics” (Keynes’ term) did in fact not assume that prices and wages are fully flexible, but this is less important for what I want to discuss here. However, the focus on whether prices are sticky or not took away focus from what in my view is a core assumption Keynes makes and, which economists today continue to make and that is that the economy is essentially operating on a monetary standard similar to the gold standard or a fixed exchange rate regime. When I was taught the Keynesian cross we where told that there was no money in the model – or at least that we ignored it. No big deal was made of it and there was no discussion about whether this was important or not. Now more than two decades later I think that economics students around the world generally are introduced to macroeconomics in the exact same way. We start out with the Keynesian cross, but students are not told that this starting point makes a clear – untold – assumption about the monetary policy regime. Hence, the case it not that there is no money in the rudimentary Keynesian model, but rather that the supply of money (base money) was determined by a gold standard-like rule. However, this was never discussed when I took my first macroeconomic lessons – and I suspect this still is the norm around the world. What I here will argue is that if Keynes instead had set out to write a truly General Theory, where he would have discussed the importance of different monetary policy rules then it would indeed have been a General Theory rather than a Theory of a Specific Monetary Regime (the gold standard). Rather what Keynes discusses in General Theory is how the macroeconomic situation looks like in a variation of the gold standard. He was in fact formulating a model for the British economy in 1930 or so. In that regard it is also notable that even though Keynes had called the gold standard a barbaric relic he argued against Britain giving up the gold standard and he seemed to continue to think of the British economy (and any other economy in the world) as operating on a gold standard-like monetary regime long after the gold standard had been given up around the world. He was of course instrumental in setting up the post-War Bretton Wood system, which introduced a global system of fixed – but adjustable – exchange rates. Thereby ensuring that his “model” of the economy still could be said to be “right”. Yes, he was assuming that prices and wages where sticky, but that was not the crucial assumption. The crucial assumption was his assumption about the monetary policy regime. We can illustrate this by accepting Keynes’ assumption that prices are not just sticky, but completely fixed (at least in the short-run). We can illustrate that in an AS/AD framework by claiming that that the AS curve is horizontal. This means that no matter what level of aggregate demand (AD) we have in the economy the price level will remain unchanged. Lets say some “animal spirits” causes investments to collapse (this was essential Keynes’ explanation for the Great Depression). 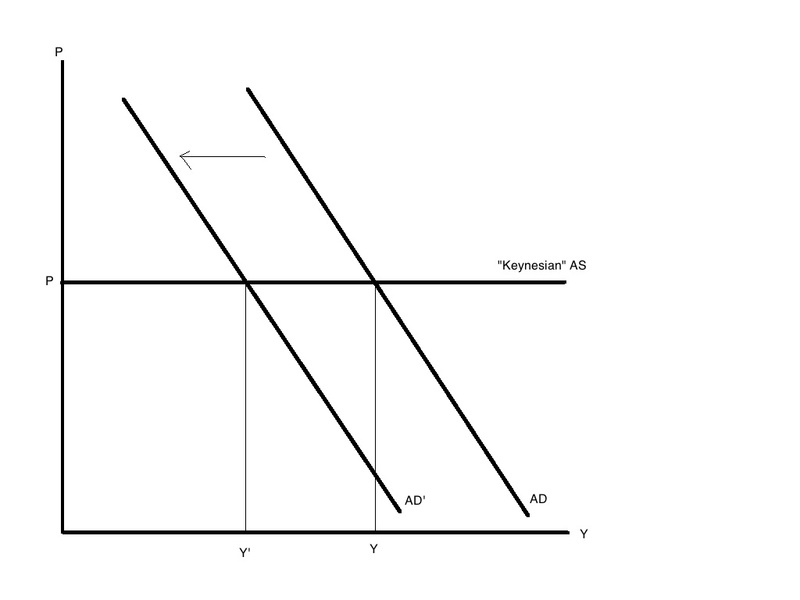 The AD curve shifts to the left causing real GDP to drop to Y’ from Y. As the AS curve is completely flat nothing happens to prices. This is essentially what we have in the rudimentary Keynesian model. But what have we assumed about monetary policy? Well, we have assumed that the money supply/base is fixed. No matter what happens to the economy the money base is just kept unchanged. This is of course what you (more or less) have under a gold standard. But what if we had another monetary policy rule – for example a rule to keep nominal GDP (nominal spending) constant. This would mean that the central bank would change the money base to keep P*Y constant. Again lets illustrate this within an AS/AD framework and note that we maintain the assumption of completely fixed prices (a horizontal AS curve). Here again the AD initially drops for example because some animal spirits cause aggregate demand to drop (1). 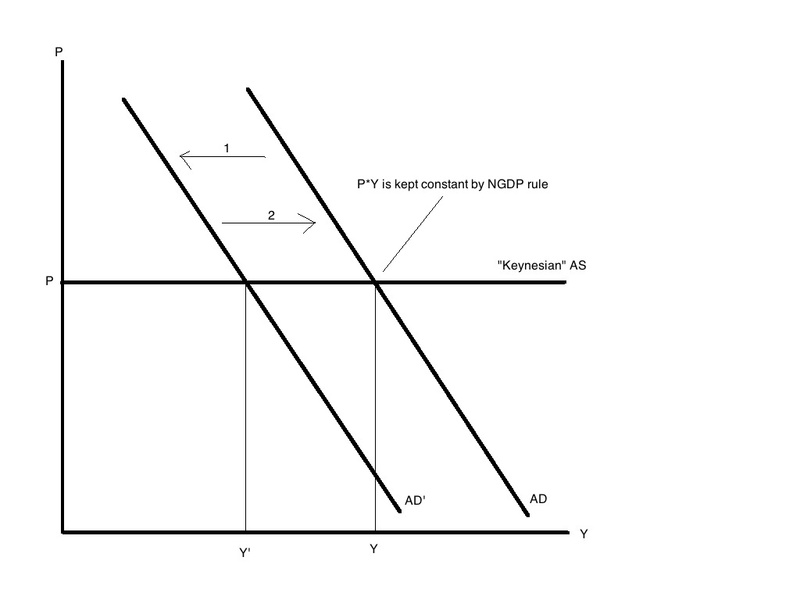 However, this would cause nominal GDP (P*Y) to drop and as the central bank operates an NGDP target rule it would automatically increase the money base until the AD curve has been push back to the starting point (2). So even if we assume completely fixed prices the world looks as if it is “Classic”. We will always be at the “full employment” level of real and nominal GDP. This also illustrates that it was not enough for Keynes to assume that prices are sticky (not a very heroic assumption for the short-run and most “Classic” economists in fact agreed with that assumption), but he also had to make an assumption that the money base was fixed and all his results breakdown if another assumption about the monetary policy regime is introduced. This of course also illustrate that Keynes’ famous fiscal multiplier and his argument that fiscal policy can (and should) boost aggregate demand are crucially dependent on assuming a gold standard style monetary policy regime. Hence, the graph above illustrates that even if prices are fixed the fiscal multiplier will be zero under an NGDP targeting regime. This is what we today know as the Sumner Critique. Obviously it was completely natural to assume that the economy was operating within a gold standard when Keynes wrote the General Theory. However, his insistence on focusing on fiscal policy and ignoring the monetary policy regime for decades caused macroeconomic discourse to be side-tracked. Had he instead argued that his results were crucially dependent on the monetary policy regime then he would truly have written a General Theory and the debate could have been shifted to a discussion about the monetary regime. Keynes was of course right that the gold standard was barbaric relic, but he failed to understand that the Great Depression was not caused by animal spirits, but was a direct result of this barbaric relic. Instead Keynes argued against Britain giving up the gold standard and instead argued for major public works programs. This is what he tried to justify in his General Theory. For decades after the publication of General Theory macroeconomists around the world adopted Keynes’ reasoning without realising that Keynes’ core policy recommendations were based on an assumption that we remained on a gold standard. Unfortunately most of today’s macroeconomists continue to ignore the crucial importance of what monetary policy regime we operate under. Going back to my university days again. Following the induction of the rudimentary Keynesian model and the introduction of the famous definition of aggregate demand as Y=G+I+C+X-M we where taught that there of course where other schools of thought. However, it was never emphasised that we basically all through remained more or less ignorant about the importance of monetary policy rules. Hence, instead the discussion instead focused on two other topics. First, whether prices and wages indeed were fixed/sticky or not. Second what assumptions we should make about the interest rate elasticity of money demand and investments. This boiled down to two “extreme” assumptions in first the AS/AD model (in a Keynesian variant) and in the IS/LM model. First we where told that if we assumed prices where fully flexible then the AS curve would be vertical and that would mean that fiscal policy (and monetary policy) would never be able to increase real GDP and any fiscal or monetary “stimulus” would just cause inflation to increase. This was called – and still is in most mainstream macroeconomic textbook – the Classical position. This very obviously is a misnomer, which we should blame Keynes for. Hence, most pre-Keynesian “Classical” economists did indeed not assume fully flexible wages and prices. Furthermore, the extreme Keynesian position was exactly unrealistic as everybody can see that real-world prices change all the time. Something which rarely where noted when I took my macroeconomic lessons at the University of Copenhagen in the early 1990s. It was easy for our professors to dismiss the assumption about fully flexible price. Just look out the window. There are lot of wage contracts and “menu costs” etc., which cause prices to become sticky. 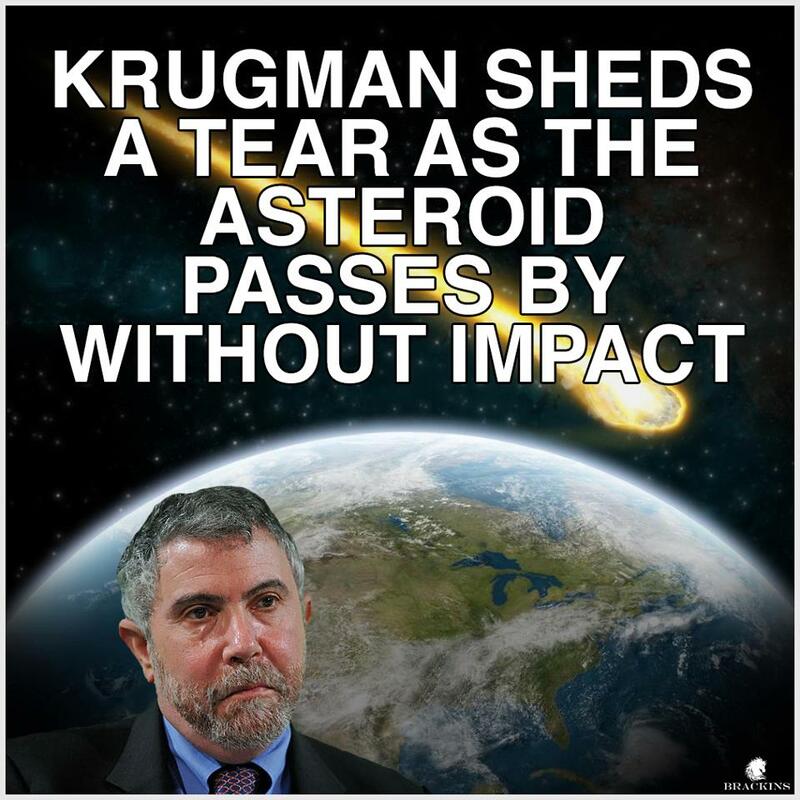 Hence, the world was essentially Keynesian. The fiscal multiplier was of course positive – or that is how the argument when. It was enough to show to prices are not fully flexible to argue that we where in a Keynesian world. When discussing the IS/LM model we again were introduced to an extreme position. The position was that the level of interest rates did have no impact on the demand for money, which would cause the LM-curve to become vertical. This was termed the “monetarist” position. This assumption was harder for our professors to dismiss than the assumption of fully flexible prices, but they could nonetheless come up with graphs for different countries that showed a fairly clear negative relationship between the interest rate level and real money balances (M/P). So my professors concluded that of neither the AS curve nor LM curve where vertical in the real world because prices are not fully flexible and of course the demand for money depend on the level of interest rates so even though our assumptions in the rudimentary Keynesian model were a bit heroic the fundamental conclusions would still hold. The world was Keynesian and fiscal multiplier was positive. However, as with the rudimentary Keynesian model in these more “advanced” models we essentially maintained the assumption that the supply of money was fixed. The monetary policy rule essentially was a fixed exchange rate or a gold standard. This was never really stated clearly and I am sure that most of my professors never realized just how important this assumption was for the results that they presented to their students and I suspect that this remains the case for most economic professors around the world today. If Keynes really had wanted to formulated a General Theory he in my view should have started out with an AS/AD framework and then discussed the macroeconomic outcome under different assumptions of prices “stickiness” AND the monetary policy rule. I will now try to sketch an alternative General Theory, which basically encompasses all of the “normal” models, which students are introduced to in their intermediate macroeconomic lessons. The first model is the rudimentary Keynesian model. As my graph above illustrates we get Keynesian results if we assume that prices are sticky (or completely) fixed only if we also assumes that the money stock is “sticky” or fixed – i.e. if we are in a gold standard/fixed exchange rate world. This “model” probably is fairly useful in understanding the short-term economic developments in countries like Denmark, which operates a pegged exchange rate regime (a peg to the euro) or for a country like the Netherland, which is a member of a currency union (the euro area). It should, however, be noted that we in this world has made a similar problematic assumption. We have ignored the public budget constraint. Keynes did that as well, but it would probably be quite wrong when analysing the present day Greek economy to ignore the budget constrain (while we probably easily could ignore it in the case of Denmark or the Netherlands). So yes, in the case of Denmark, Netherland or Greece the fiscal multiplier might indeed be positive, but in the case of Greece the Greek government cannot afford utilizing this fact. However, the rudimentary Keynesian model will provide us with very little inside for countries with explicit inflation targets such as Sweden, Canada or Australia. Here the central banks set the money base – and as a consequence the AD curve – to ensure that a certain inflation target is hit. In this world the fiscal multiplier is zero. This would mean that the world looks as if it is “Classic” or “monetarist” (in the textbook lingo). This would even be the case if we assume that prices are completely fixed. This is more or less similar to the second graph above (the NGDP targeting case). Note this is course not because Swedish prices are more flexible than Danish prices, but because of differences in the monetary policy regime. Paradoxically enough both Danish and Swedish economics students still to this day are introduced to macroeconomics starting with the rudimentary Keynesian model. Rarely (I think) is there made in reference to the importance of the monetary policy regime in the two countries. When I was at university in the early 1990s the new hot thing in macroeconomics was the so-called Real Business Cycle model. The RBC models were a real break with Keynesian thinking as RBC theorists like Nobel Prize winner Edward Prescott argued that the business cycle essentially was driven by supply shocks rather than demand shocks. I remember thinking at the time that the idea that the primary cause of business cycles was supply shocks was crazy. As did most other students and professors, but it was mathematically an impressive set-up, which caused some interesting among students and professors and I was personally equally attracted the RBC theorists insistence on having a proper microeconomic foundation for macroeconomics. However, today even though I am rather sceptical about the empirical relevance of RBC models I most say that the RBC model would likely be the best model to descript the economic development under a “perfect” NGDP targeting regime. Again it is about the monetary policy. Something RBC theorist in a similar fashion as Keynesian before completely ignored. Instead early RBC theorist made rather bizarre assumptions about price and wage flexibility that seemed to live up to live up to Keynes’ caricature of the “Classical” economists. Anyway, if we in an AS/AD framework assume that the central bank has a nominal GDP target then it becomes obvious that all the ups and downs in economic activity will be a result of supply shocks. Hence, all shocks to demand will be “neutralized” or offset by the monetary policy rule to keep aggregate demand fixed (or fixed around a steady growth path). There will be no aggregate demand shocks. We can get shocks to the composition of aggregate demand, but the fiscal multiplier is zero and even if we assume that investments are determined by irrational and crazy animal spirits aggregate demand will grow at a steady fixed rate. Hence, under “perfect” NGDP targeting the world would look as if the RBC model is right. This is not because demand shock can’t influence the economy, but because monetary policy ensures that that will not be the case. I hope to have demonstrated above that the crucial assumption we make in macroeconomic models is not primarily the assumptions about prices flexibility or interest rate elasticities as macroeconomic students still are taught, but the assumption about the monetary policy regime. Hence, some real world economies look “Keynesian”, while other looks “Classic” and other look like RBC economies – even if we assume the same level of price stickiness. It is the monetary policy regime stupid! This semester professor Daniel Lin is teaching a class in Macro at the American University and I have a tradition to interfere with how Daniel should teach his students – so I will not let down the opportunity to do it once again. I have already written a post on how I think Econ 101 should be taught. So I don’t want to go through that once again and I have also written about why Daniel should be happy about his earlier class on Micro. I have for sometime been thinking about the impact on how macroeconomics is taught to economics students as I fundamentally think most “practicing economists” for example civil servants or financial sector economists think about macroeconomic issues based on what they learned by reading the first 150 pages of their first (and only?) macroeconomic textbook. Few practicing economists ever think about intertemporal optimization, rational expectations, monetary policy reactions functions etc. Yes, everybody know about New Keynesian models and most central banks will proudly show off their DSGE models, but the fact is that most central bankers, civil servants and commercial bankers alike really are just using a rudimentary paleo Keynesian model to think about macroeconomic issues. My first macroeconomic textbook was Dornbusch and Fischer’s textbook “Macroeconomics”. It is a typical American textbook – far too many pages and far too many boxes and graphs. Nonetheless I still from time to time have a look in it – even though I read it first time in 1990. The book consists of three parts, but since we will only focus on the first 150 pages (remember that is what the practicing economists remember) so we will only get half through the first part of the book (yes, US textbooks are far too long). On the first 150 pages we are introduced first to the simple (paleo) Keynesian model and we learn that Y=C+I+G+X-M. There are really no prices, no financial markets and no money in the model. A shocking number of practicing economists in reality think about macroeconomics based on these simple (and highly problematic) models. The more clever steudent gets to the next 50 pages, where money and a very rudimentary financial sector (the bond market) is introduced. This is the IS/LM model. I am really not happy about this way of introducing future economists to macroeconomics – I would much prefer starting from a more clear micro foundation as I have described in an earlier post. Anyway, lets assume that we are stuck with one of the standard macroeconomic textbooks so we will have to go along with the paleo Keynesian model and the IS/LM stuff. But lets also assume that we can do that in 140 pages – so we now have 10 pages to add something interesting. I would use the last 10 pages to introduce a monetary policy reaction function into the IS/LM model – let call this model the IS/LM+ model. Most economic students are taught that central banks have an inflation target, but that is not really a proper target in the IS/LM model as there is no inflation in the IS/LM model as prices are pegged (actually most students and there professors don’t even notice that there are prices in the model). So lets instead imagine that the Market Monetarists’ propaganda has been successful and that nominal GDP targeting has become commonly accepted at the target that central banks should have. Lets return to the monetary policy target below, but lets first start out with the IS and LM curves. Note, however, that the slope of the LM does not only depend on the money demand’s interest rate elasticity (α), but also on how aggressive (λ) the central bank will react to deviations in NGDP (p+y) from the target (set at zero). This is the key difference between the IS/LM+ model and the traditional IS/LM model. The fact that the slope of the LM curve depends on λ is critical. Hence, if the central bank is fully committed to hitting the NGDP target and will do everything to fulfill it then λ will equal infinity (∞) . Obviously, if λ=∞ then the LM curve is vertical – as in the “monetarist” case in the textbook version of the IS/LM model. However, contrary to the “normal” LM curve we don’t need α to be zero to ensure a vertical LM curve. With λ=∞ the budget multiplier will be zero – said in another way any increase in public spending (g) will just lead to an increase in the interest rate (r) as the central bank “automatically” will counteract the “stimulative” effects of the increase in public spending by decreasing the money supply to keep p+y at the target level (p*+y*). This of course is the Sumner Critique – monetary policy dominates fiscal policy if the central bank targets NGDP even in a model with sticky prices and interest rates sensitive money demand. I think this is all we need to fundamentally change the thinking of future practicing economists – one more equation (the monetary policy reaction function) in the IS/LM model. That would make practicing economists realize that we cannot ignore the actions of the central bank. The central bank – and not government spending – determines aggregate demand (NGDP) even in a fundamentally very keynesian model.